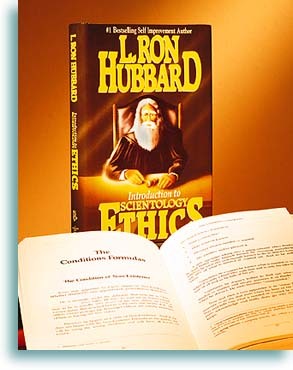 although originally written for use by Scientology organizations, these conditions and their formulas are applicable to any endeavor and to all quarters of society  even, as we shall see, the criminal quarter. No less broadly workable is that which naturally complements LRH ethics technology: the L. Ron Hubbard system of justice. "When the individual fails to put in his own ethics," he very simply explains, "the group takes action against him and this is called justice." As the statement implies, justice should only be used until such time as ones own ethics "render him fit company for his fellows." Otherwise, and herein lay what he decried as the failing from Hammurabi forward, "justice becomes an end-all in itself." The LRH solution is a system of justice as equitable and workable as his system for personal ethics. Once again, although originally designed for use within Scientology organizations, the principles are applicable to any circumstance. Included are the proper gradients of justice actions according to degree of severity, the theory and practice of petition as a means of seeking redress from wrongs and the delineation of awards and penalties according to production. Also, of course, included are the tools for rehabilitation through justice to a point of personal ethics whereupon, as LRH reiterates, "justice no longer becomes the all-important subject that it is made out to be." All notions of ethics and justice, Ron once remarked, have traditionally had but one of two aims: to cut off a head or bestow a pardon. In this peculiar age of "enlightened barbarity," as he so aptly puts it, the machinations may have grown exceptionally complex, what with rituals of plea bargaining and appeal (spawning at least in the United States a legal industry that dwarfs virtually all other economic sectors). But when it all comes down to brass tacks  to that grimly resounding gavel on the bench  the ends are only twofold: punishment or reprieve. It comes as no small statement, then, to say, here is the means by which "man can learn how to put his own ethics in and climb back up the chute." Here is the "brand-new result, the likes of which nobody ever dreamed of." Today, the technology by which those results are obtained may be found in L. Ron Hubbards Introduction to Scientology Ethics. Within that work is the foundation of all that has been presented here, including, as we shall also see, the means by which even the most seemingly incorrigible criminals can, step by step, place themselves back on that road to honesty, decency and self-respect.